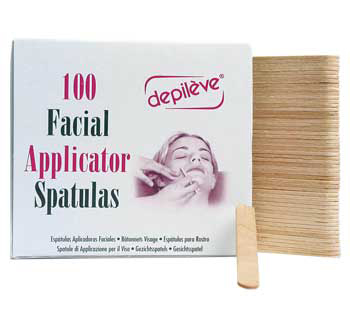 Facial Applicators - 100ct Disposable Wooden applicators allow a thin and consistent application at a minimum cost. The clients want quick, efficient and hygienic body waxes each time they come in for a session. No matter how many successful sessions you provide your clients it only takes one failed session to lose a client. Make sure you don’t lose any clients by maintaining your supplies and waxing products. Some such important tools in body waxing are these Depileve Eyebrow Applicators. Dimension: 4.5" L x 0.4" W x 0.08" Thick.